Attractive antique Victorian Arts & Crafts carved walnut bedside side cabinet. The front of the cabinet has a very decorative flower carved panelled door. It is fitted with a brass drop handle mounted on a shapely brass back plate and is secured by a later added ball catch. The interior is fitted with a mid mounted, removable wood shelf. The front features a decorative carved apron. The cabinet has an overall height of 30" (76cm), a width of 17" (43cm) and a depth of 16.5" (42cm). 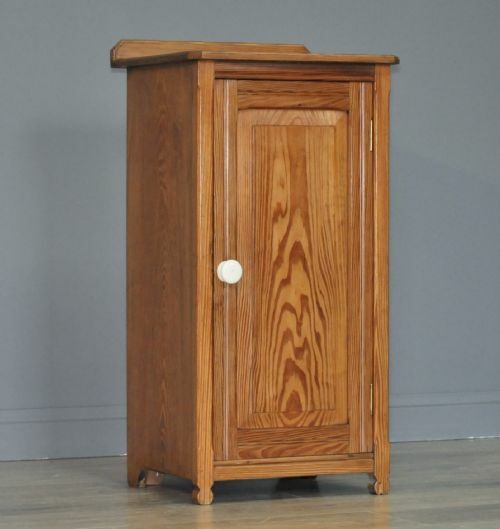 This attractive Victorian walnut cabinet remains in very good solid condition with only very minor surface markings commensurate with age and usage. There are a number of small indentations, light ring marks and light scratches primarily to the top surface from past use. 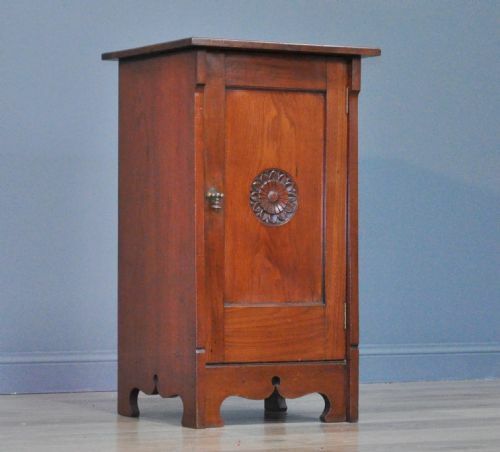 This remains a very stylish & elegant Victorian walnut cabinet. It could serve well as either a bedside cabinet or as a side cabinet. It will continue to provide sterling service for many years to come. A lovely Victorian bedside cabinet. We date this cabinet to the second half of the 19th century. The front of the cabinet has a very decorative carved panelled door. It is fitted with a coppered drop handle mounted on a shapely back plate and is secured by a top catch. The cabinet has an overall height of 30" (76cm), a width of 17" (43cm) and a depth of 15.5" (40cm). 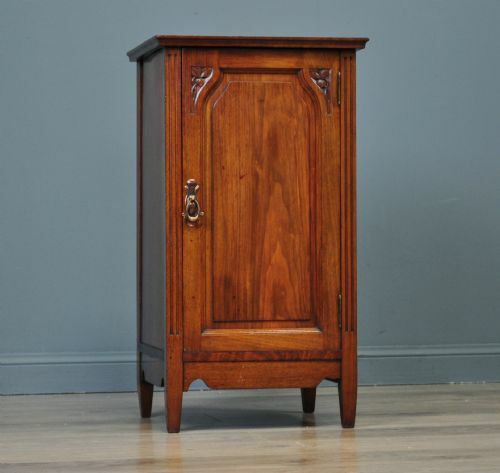 This attractive Victorian walnut cabinet remains in very good solid condition with only very minor surface markings commensurate with age and usage. There are some light usage marks to the top surface from past use.